Swedish Torch, Canadian Candle, or whatever you call it, burning an upright log or bundle of wood is a fun twist on your normal campfire. Instead of laying wood on the ground, lighting it, coaxing it to flame, and waiting for embers to cook on, this alternative fire style has some benefits. By keeping the wood in a vertical stack, it lights easily and self-ventilates to burn hot faster with less smoke. Since the wood is not lying scattered around the firepit, less wood is consumed. You can start cooking faster. The basic steps are to gather 6 to 8 split wood wedges of the same length. Split off an inch or so from the inner tip and save these small pieces for kindling. Bundle the pieces together with their bark sides facing outward and that split off angle in the center - this should create what looks something like a single large log with a hole in the center. Place the split kindling in the hole and add tinder. When the center is lit, it creates an updraft which pulls fresh air in and quickly burns. The embers and coals that are formed fall into the protected center of your bundled log where their concentrated heat ignites the fuel wood. The main challenge of this kind of fire is keeping the wood bundle standing vertically. 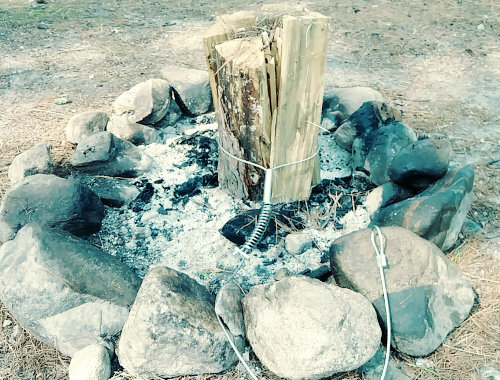 You could wrap a rope or string around, but as soon as it burns, the whole pile falls apart. A better solution is the WilderSol Vertical Burn - a stout wire with compression spring to hold the wood together. This keeps pressure on the wood as it burns which keeps the whole bundle standing longer. Here's a video showing the stages of burning. This was using just 5 pieces of dry pine and some pine needles. It stayed upright and burning for 45 minutes before the crumbling coals finally gave way. Using hardwood would create a longer lasting fire. If you use wood that is cut straight and the same lengths, you can place a skillet or pot directly on the log and start cooking in just a few minutes rather than waiting for 20 or 30 minutes for a normal fire to have enough coals. A vertical fire also affects a smaller area of ground, keeping more of a campsite clean and living. Has your scout group ever had a fire like this?